Wing span: 2 - 3 3/8 inches (5 - 8.6 cm). Identification: Upperside tawny to orange-brown with black markings. Underside of hindwing with inwardly rounded silver spots in marginal row; other silver spots are elongated. 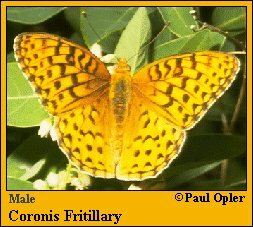 Life history: Males patrol open areas to find females. Females may delay egg-laying until late summer. Eggs are laid singly on litter near violets. First-stage caterpillars overwinter unfed; in the spring they feed on violet leaves. Flight: One flight from mid-June to September. Caterpillar hosts: Violets including Viola nuttallii, V. purpurea, V. douglasii, and V. beckwithii. Habitat: Mountain slopes, foothills, prairie valleys, chaparral, sagebrush, forest openings. Range: Southern Washington east through the Great Basin to central South Dakota, Wyoming, Nebraska, and Colorado; south through Nevada and California to northwest Baja California Norte. California. Lepidoptera Research Foundation, Beverly Hills, Calif.
Dameron, W. 1997. Searching for butterflies in southern California. Flutterby Press, Los Angeles, Calif.
Emmel, T.C. Editor. 1998. Systematics of western North American butterflies. Emmel, T. C. and J. F. Emmel. 1973. The Butterflies of Southern California. Natural History Museum of Los Angeles County Science Series No. 26.
of Research on the Lepidoptera 18: 24-35.
of the Research on the Lepidoptera 23: 282-296. Systematic Biology, University of california, Irvine.